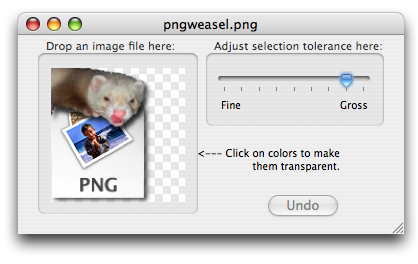 pngweasel is our second fun little Mac OS X utility we put together to handle a common web developer's task: converting an image to the PNG image format and making parts of the image's background transparent. Here then enters pngweasel. It's lightweight, it's free, it's easy to use, and yes, there is a weasel. You can also visit pngweasel's cousin utility, gifweasel for your GIF image transparency editing needs. The latest version of pngweasel is 1.0, released on May 4th 2008. It runs on Intel-based and PowerPC-based Mac computers and is compatible with Mac OS X v. 10.4.4 or later.